Niah Caves is located within the district of Miri in Sarawak, Malaysia. 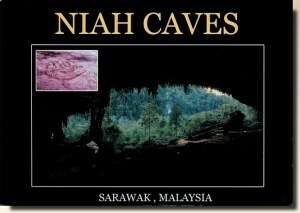 Part of Niah National Park, the main cave, Niah Great Cave, is located in Gunung Subis and is made up of several voluminous, high-ceilinged chambers. The Great Cave lies in a large limestone block, about a kilometre long in general north to south direction and about half a kilometre wide, that is detached from the main Gunung Subis complex, by a valley between about 150 to 200 meters wide. The main Gunung Subis complex rises to about 394 meters above sea level at its highest point. The whole "Gunung Subis Limestone Complex" lies some 17 kilometres inland from the South China Sea coast and about 65 kilometres south west of the town Miri. It is roughly heart shaped measuring five kilometres from its northern tip to the south and four kilometres across.